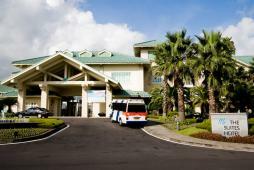 3-story villa style luxury resort hotel The Suite Hotel Jeju opened in 2003. Simple but carefully designed guestrooms, interior with sober atmosphere and state-of-the-art facilities offer a relaxing vacation. The hotel is located in Chungmoon Tourist Complex at the southern beach in Jeju and it is rather compact and luxurious villa hotel comparing to other large hotels around it. Though the size is compact, rooms are equipped with a variety of facilities and interior are carefully selected so the hotel is gathering attention by young people as well. The hotel offers a resort mood with the white and light green building exterior and pool and boat in a pool located in the inner courtyard. There are 90 rooms with a selection of 7 types of rooms which are European style royal suite, junior, simply decorated and relaxing superior, deluxe with a view of outdoor pool and Mt. Halla, corner deluxe with type A&B and Korean traditional ondol room. The rooms also have a selection of garden view which guests can enjoy the view of tropical garden and mountain view with a view of Mt. Halla, the famous mountain located at the center of Jeju island. Superior and Deluxe rooms have same room interior and facilities but differ in floor level.